By Brandy Dykhuizen. Our Week In Review sums up our weekly comic book coverage while taking time for a new review or two before it’s all over. 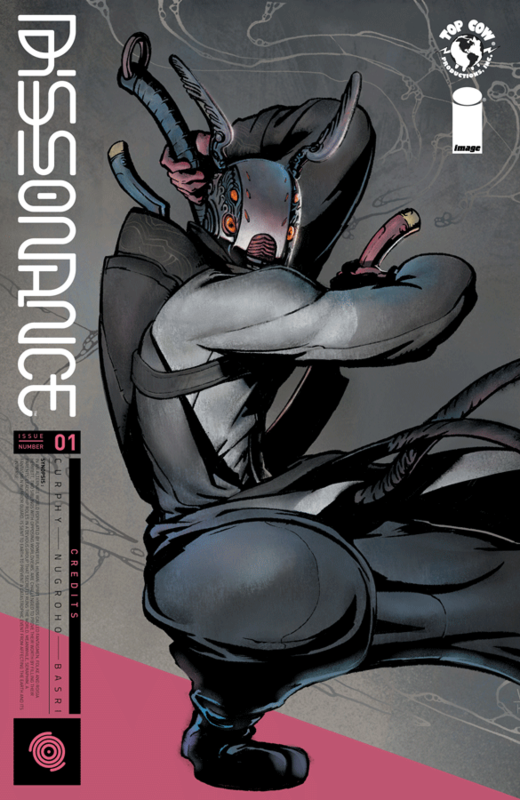 This week: ‘Abbott’ #1, ‘X-O Manowar’ #11, and ‘Dissonance’ #1. Racism, police brutality, and misogyny. Abbott #1 may be set in 1972 Detroit, but this is a period piece that wouldn’t feel out of place were it set today. Elena Abbott unapologetically breaks up the boys club, completely disinterested in the rules of engagement, on a singular mission to find the truth. Snubs and slurs roll off her like water. As both a woman and person of color, she’s used to dealing with this white male nonsense, and has chosen a profession where she can fight the power via the dissemination of truth. 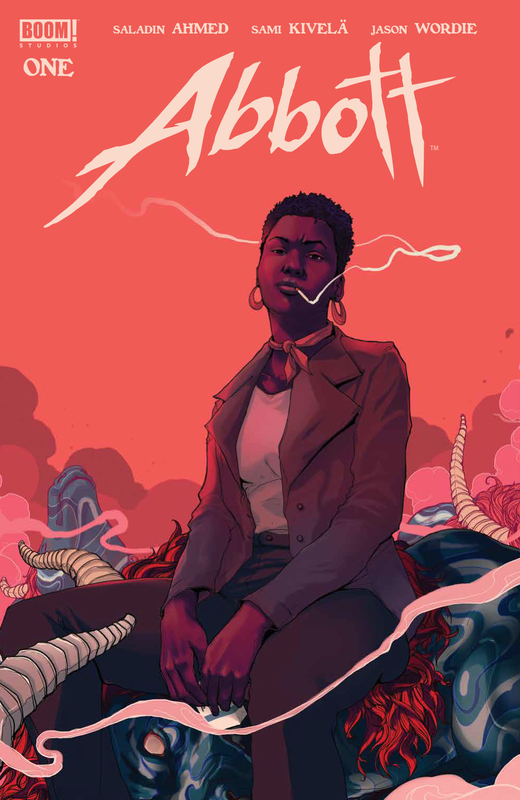 Saladin Ahmed sets the scene as straightforward and unrepentantly as Abbott herself. The juxtaposition of Abbott’s need for routine and facts with a visit from the spirit world makes this book even more compelling. Since we already trust Abbott, the paranormal aspects of the story integrate more easily. It’s unexpected, sure, but it doesn’t blindside us. Sami Kivelä captures the 70s aesthetic and Abbott’s attitude perfectly, page after page, with a no-frills approach to each scene. Overlapping and inlaid panels keep the story sauntering along as smoothly as our protagonist herself. When the gore makes an appearance, it’s presented without sensationalism – it’s Abbott’s reaction that we really need to see. This could just as easily have been a book about truth and justice being the real heroes, without a visit from the underworld, and it would still be engaging. You’d only be doing yourself a favor by giving this one a try. Written by Singgih Nugroho and Ryan Cady. In this beautifully drawn sci-fi series, writers Singgih Nugroho and Ryan Cady lay out all the necessary exposition right away in order to head into the action. Laying down the laws and explaining the elements of their modern Earth right off the bat may not be a particularly elegant form of world building, but that approach frees up the much-needed space for the book to touch on its many other intriguing themes. In Dissonance, duplicity is inherent in a hybrid species, as if humans weren’t already shifty beasts. Class hierarchies are set by how much alien essence courses through your body. The takeover of the human race is presented as a symbiotic relationship, but it’s really more of a “civilization at the hand of the sword” sort of thing. And, since people are people, they run the gamut of acceptance and protest on New Earth, from embracing the knowledge their new friends offer, to shouting for a pure human race. Sami Basri draws the fantasmen as gracefully as our wee brains could imagine creatures made of knowledge and light. His attention to detail doesn’t stop at a creature’s countenance; it materializes in every button, fold and cuff. Despite what may be going on behind closed doors, he makes the regular world seem airy, beautiful and fun. The added knowledge that the fantasmen bring seems to make people happy, and we see it. He draws the dissenters, the master race-ers, with darkened, blacked out eyes – their mouths are shouting, but they can’t truly see. The book somehow has the feel of being all over the place yet remains strangely cohesive. The story is full of surprises, but none seem out of place, and all of them make you want to be there next time. I found it even more enjoyable on the second read, and I’ll definitely be returning to this series. 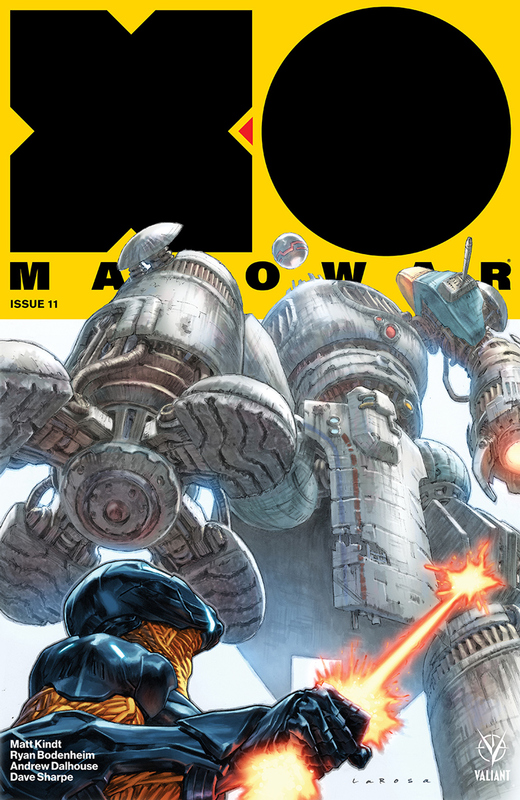 A fine jumping-on point for new readers, X-O Manowar #11 dives beneath the surface of its flawed hero for a look at how far the mighty can fall. Revolutions cause a seismic shift in dogma and power, but there’s a reason you don’t turn to your demolitions expert to lay a new foundation. Aric nobly tries to lead an entire planet to peace and prosperity, but the added responsibility proves to be problematic for a guy who hasn’t learned to delegate. Enter a terrifying team of bounty hunters, pulling the rug out from under the Visigoth’s pretentions and threatening harm to his nearest and dearest if he doesn’t do as they say. It’s a cheap trick for the baddies to play, but Matt Kindt uses it to underscore the pride and valor of such a warrior. Even at his most incensed and combative, Aric’s loyalty still runs true. The resulting twist induces empathy between the scenes of action and defiance. Knowing what our hero doesn’t, we watch Aric’s status plummet to almost, at times, the fool. Subversion, betrayal, lies… no matter how many suns your galaxy has, there’s nothing new under a single one of them. Ryan Bodenheim minimizes landscape and focuses on his wonderfully creative creatures to showcase what Aric’s really up against. Overall, X-O Manowar #11 is an exciting dive into Aric’s world. What books did YOU read this week? We want to know! Tell us about those feelings of yours in the comments section below.